All through my college years I skied on wooden skis, Northlands to be precise. That was an economic decision based on what I could afford and the fact that a neighbor worked for Northland in their Laconia, New Hampshire, factory. However I dreamed of being able to afford my dream ski: the Hart Javelin! Today it’s hard for me to recall all the reasons I wanted Javelins, but one of the reasons was Art Furrer. “The Incredible Skis” was a ski movie sponsored by Hart skis that came out in 1967. It featured Roger Staub and Art Furrer on Hart Javelins. 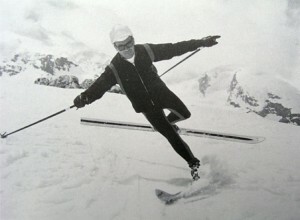 Furrer played a computer nerd who comes up with the perfect ski that skis itself. Furrer didn’t have to do much to look the part of the nerd since he actually wore horn-rimmed glasses. Furrer was a clown-prince on skis and the movie highlighted some of his trademark tricks on skis. There was the Charleston, the Reuel (Royal) Christy, the Butterfly, the step-over, and the Javelin turn. All of these were done on 205cm or longer skis, of course. Plus there were plenty of scenes with powder and glacier skiing. 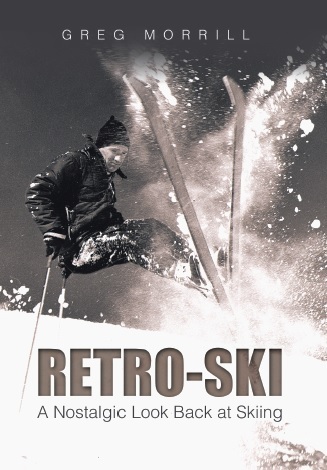 In the credits at the end of the movie it identifies the skiers as Roger Staub of Vail and Art Furrer from Bolton Valley, Vermont! 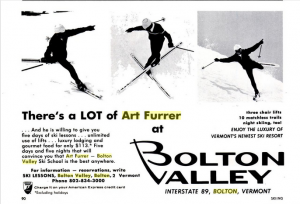 That’s right, Art Furrer was the first ski school director at Bolton Valley. There is even one scene in “The Incredible Skis” filmed at Bolton Valley (that scene also included Rudi Wyrsch who was at Bolton Valley at that time.) No one correctly identified Art Furrer in response to last week’s trivia question. It was actually quite a coup for Bolton Valley to land one of the more recognizable names in skiing at that time. Art Furrer grew up in the Swiss Alps. He was a promising ski racer as a youth, but his family couldn’t afford the expense ski racing entailed. Instead by the age of 18 he was a professional ski instructor helping to support the family. Art had always liked fooling around on skis and he factored it into his ski teaching. He would wear a clown suit and demonstrate the wrong way to ski while other instructors would demonstrate the correct way. Art Furrer at age 21 would become the youngest examiner in the history of the Swiss Ski Teaching Association. However Art’s antics on skis would get him into trouble with the Swiss Ski Teaching Association. He felt that balance over the turning ski – whether it was the outside ski or the inside ski – should be taught. So Art Furrer was way ahead of his time. Today’s slope style skiers have taken that concept even further: it doesn’t matter whether you ski forward or backwards, or which ski is weighted, as long as you’re balanced correctly. Anyway, that concept wasn’t popular with the Swiss Association which dropped Furrer. So Art Furrer came to the United States in 1959 to be a ski instructor at Cannon Mountain in New Hampshire. He didn’t speak any English so he taught by showing not talking. While at Cannon, Art continued perfecting his skiing tricks which attracted media attention. John Jay and Warren Miller would feature Art in their ski films. Art’s growing fame led to a sponsorship from Hart skis. Art returned to Switzerland for the 1962-63 ski season. However the opportunity to be a Henke ski boot rep brought him back to the United States in the fall of 1963. By now his English had improved, but Art faced a new challenge. Henke provided him with a station wagon and a map, but Art didn’t know how to drive! Art headed out to sell ski boots with about a half-hour of instruction and a phony driver’s license. Morten Lund tells a great story of how Art came up behind a police cruiser that was stopped at a red light. Art was so nervous that he stepped on the gas instead of the brake and knocked the police cruiser into the intersection. While Art feared the worst, the police took mercy on the foreigner with the strong accent. He ended up buying them some beer and they escorted him to his sales call. Art came to Bolton Valley in 1966, but it’s not clear how much time he actually spent there. He had a busy schedule with his commitment to Hart, he was also a fixture at ski shows, he appeared on TV shows, and he was featured in some of the biggest ski movies of the late 1960s such as “The Outer Limits” and “The Moebius Flip”. Art Furrer took the money he made in the United States and invested in Swiss real estate where he now owns about a dozen hotels in the Matterhorn region.